Eczema can affect people of any age, although the condition is most common in infants, and about 85% of those affected have an onset prior to 5 years of age. Eczema will permanently resolve by age 3 in about half of affected infants. In others, the condition tends to recur throughout life. People with eczema often have a family history of the condition or a family history of other allergic conditions, such as asthma or hay fever. Atopic dermatitis is believed to belong to a group of related diseases including food allergy, asthma, and allergic rhinitis that tend to develop in sequence, suggesting that atopic dermatitis early in life may lead to or predict later allergic diseases. The nature of the link between these conditions is inadequately understood. Up to 20% of children and 1%-2% of adults are believed to have eczema. Eczema is slightly more common in girls than in boys. It occurs in people of all races Eczema is not contagious, but since it is believed to be at least partially inherited, it is not uncommon to find members of the same family affected. Doctors do not know the exact cause of eczema, but a defect of the skin that impairs its function as a barrier, possibly combined with an abnormal function of the immune system, are believed to be important factors. Studies have shown that in people with atopic dermatitis there are gene defects that lead to abnormalities in certain proteins (such as filaggrin) that are important in maintaining the barrier function of normal skin. Some forms of eczema can be triggered by substances that come in contact with the skin, such as soaps, cosmetics, clothing, detergents, jewellery, or sweat. Environmental allergens (substances that cause allergic reactions) may also cause outbreaks of eczema. Changes in temperature or humidity, or even psychological stress, can lead to outbreaks of eczema in some people. WHAT ARE ECZEMA SYMPTOMS AND SIGNS IN BABIES, CHILDREN AND ADULTS? Eczema most commonly causes dry, reddened skin that itches or burns, although the appearance of eczema varies from person to person and varies according to the specific type of eczema. Intense itching (pruritus) is generally the first symptom in most people with eczema. Sometimes, eczema may lead to blisters and oozing lesions, but eczema can also result in dry and scaly skin (xerosis is the medical term for dry skin). Repeated scratching may lead to thickened, crusty skin (lichenification). While any region of the body may be affected by eczema, in children and adults, eczema typically occurs on the face, neck, and the insides of the elbows, knees, and ankles. In infants, eczema typically occurs on the forehead, cheeks, forearms, legs, scalp, and neck. Eczema can sometimes occur as a brief reaction that only leads to symptoms for a few hours or days, but in other cases, the symptoms persist over a longer time and are referred to as chronic dermatitis. Atopic dermatitis is a chronic skin disease characterised by itchy, inflamed skin and is the most common cause of eczema. The condition tends to come and go, depending upon exposures to triggers or causative factors. Factors that may cause atopic dermatitis (allergens) include environmental factors like molds, pollen, or pollutants; contact irritants like soaps, detergents, nickel (in jewellery), or perfumes; food allergies; or other allergies. Around two-thirds of those who develop the condition do so prior to 1 year of age. When the disease starts in infancy, it is sometimes termed infantile eczema. Atopic dermatitis tends to run in families, and people who develop the condition often have a family history of other allergic conditions such as asthma or hay fever. Contact eczema (contact dermatitis) is a localised reaction that includes redness, itching, and burning in areas where the skin has come into contact with an allergen (an allergycausing substance to which an individual is sensitised) or with a general irritant such as an acid, a cleaning agent, or other chemical. Other examples of contact eczema include reactions to laundry detergents, soaps, nickel (present in jewellery), cosmetics, fabrics, clothing, and perfume. Due to the vast number of substances with which individuals have contact, it can be difficult to determine the trigger for contact dermatitis. The condition is sometimes referred to as allergic contact eczema (allergic contact dermatitis) if the trigger is an allergen and irritant contact eczema (irritant contact dermatitis) if the trigger is an irritant. Skin reactions to poison ivy and poison sumac are examples of allergic contact eczema. People who have a history of allergies have an increased risk for developing contact eczema. Nummular eczema (nummular dermatitis) is characterised by coin-shaped patches of irritated skin -- most commonly located on the arms, back, buttocks, and lower legs -- that may be crusted, scaling, and extremely itchy. This form of eczema is relatively uncommon and occurs most frequently in elderly men. Nummular eczema is usually a chronic condition. A personal or family history of atopic dermatitis, asthma, or allergies increases the risk of developing the condition. Neurodermatitis, also known as lichen simplex chronicus, is a chronic skin inflammation caused by a scratch-itch cycle that begins with a localised itch (such as an insect bite) that becomes intensely irritated when scratched. Women are more commonly affected by neurodermatitis than men, and the condition is most frequent in people 20-50 years of age. This form of eczema results in scaly patches of skin on the head, lower legs, wrists, or forearms. Over time, the skin can become thickened and leathery. Stress can exacerbate the symptoms of neurodermatitis. Stasis dermatitis is a skin irritation on the lower legs, generally related to the circulatory problem known as venous insufficiency, in which the function of the valves within the veins has been compromised. Stasis dermatitis occurs almost exclusively in middle-aged and elderly people, with approximately 6%-7% of the population over 50 years of age being affected by the condition. The risk of developing stasis dermatitis increases with advancing age. Symptoms include itching and/or reddish-brown discoloration of the skin on one or both legs. Progression of the condition can lead to the blistering, oozing skin lesions seen with other forms of eczema, and ulcers may develop in affected areas. The chronic circulatory problems lead to an increase in fluid buildup (edema) in the legs. Stasis dermatitis has also been referred to as varicose eczema. Dyshidrotic eczema (dyshidrotic dermatitis) is an irritation of the skin on the palms of hands and soles of the feet characterised by clear, deep blisters that itch and burn. The cause of dyshidrotic eczema is unknown. Dyshidrotic eczema is also known as vesicular palmoplantar dermatitis, dyshidrosis, or pompholyx. This form of eczema occurs in up to 20% of people with hand eczema and is more common during the spring and summer months and in warmer climates. Males and females are equally affected, and the condition can occur in people of any age. To diagnose eczema, doctors rely on a thorough physical examination of the skin as well as the patient's account of the history of the condition. In particular, the doctor will ask when the condition appeared, if the condition is associated with any changes in environment or contact with certain materials, and whether it is aggravated in any specific situations. Eczema may have a similar appearance to other diseases of the skin, including infections or reactions to certain medications, so the diagnosis is not always simple. In some cases, a biopsy of the skin may be taken in order to rule out other skin diseases that may be producing signs and symptoms similar to eczema. If a doctor suspects that a patient has allergic contact dermatitis, allergy tests, possibly including a skin "patch test," may be carried out in an attempt to identify the specific trigger of the condition. There are no laboratory or blood tests that can be used to establish the diagnosis of eczema. Corticosteroid creams are sometimes prescribed to decrease the inflammatory reaction in the skin. These may be mild-, medium-, or high-potency corticosteroid creams depending upon the severity of the symptoms. If itching is severe, oral antihistamines may be prescribed. To control itching, the sedative type antihistamine drugs appear to be most effective. In some cases, a short course of oral corticosteroids (such as prednisone) is prescribed to control an acute outbreak of eczema, although their long-term use is discouraged in the treatment of this non life-threatening condition because of unpleasant and potentially harmful side effects. The oral immunosuppressant drugs cyclosporine and methotrexate have also been used to treat severe cases of eczema that do not respond to conventional treatment. Ultraviolet light therapy (phototherapy) is another treatment option for some people with eczema. Applying moisturiser frequently, especially after bathing. Bathing in warm, not hot, water and using a mild soap. Limiting or avoiding contact with known irritants like soaps, perfumes, detergents, jewellery, environmental irritants, etc. Wearing loose-fitting clothing (cotton clothing may be less irritating for many people than wool or synthetic fibers). The use of cool compresses to help control itching. Avoiding foods that cause allergic reactions. Exercise, meditation, or other stress-management techniques can help those for whom stress is a trigger. Wearing protective gloves for activities that require frequent submersion of the hands in water. Avoiding activities that make you hot and sweaty as well as abrupt changes in temperature and humidity. Using a humidifier in both winter (when the heating dries the atmosphere) and in the summer (if air conditioning is used because it depletes the moisture in the air). Maintaining cool temperatures in sleeping areas, because heat can lead to sweating that worsens itching and irritation. Practicing good skin hygiene even when you are not having symptoms. WHAT ARE THE POSSIBLE COMPLICATIONS OF ECZEMA? As mentioned earlier, people who develop atopic dermatitis often progress to develop other forms of allergic disease. Up to 30% of people with atopic dermatitis will develop asthma, and about 35% develop allergic rhinitis (nasal allergies). WHAT IS THE PROGNOSIS (OUTLOOK) FOR ECZEMA? Eczema is not a fatal disease, although it can cause significant discomfort. Medical treatments as well as lifestyle modifications can generally provide symptom relief. It is also possible in many situations to avoid known triggers of the condition. Complications such as secondary bacterial infection can be successfully treated with antibiotics. American Academy of Dermatology, Eczema. Krafchik, Bernice R. "Atopic Dermatitis." eMedicine. Jan. 19, 2010. *The content of this article excludes all references to healthE Fatty Cream. 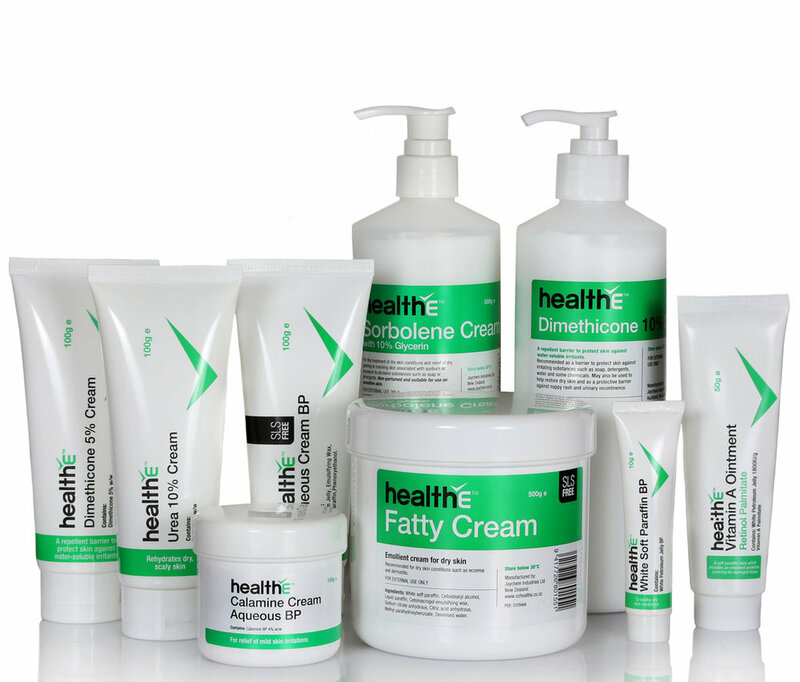 The references to healthE Fatty Cream have been inserted as part of the topical treatment for eczema.